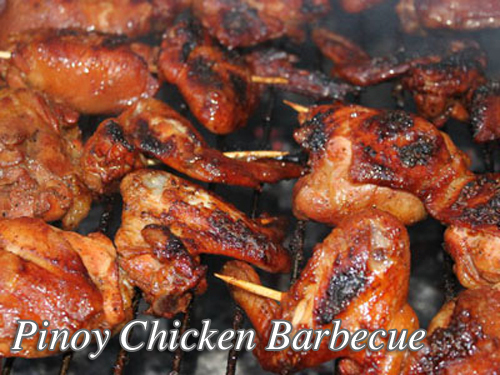 Most Filipino barbecue marinade contains soy sauce but this chicken barbecue recipe don’t have any. Just ketchup, vinegar or lemon juice and spices are used in marinating and basting the chicken. If you think soy sauce is really necessary, you can add a few teaspoons and omit the salt in this recipe. To cook this dish; Soak the barbecue sticks in water for half an hour and set aside. Prepare the ingredients for the marinade. Mix together the vinegar, garlic, onion, chilies, salt, ketchup and pepper. Mix very well and marinade the chicken pieces for about 1 to 3 hours. Drain the chicken after marinating and set aside the marinade mixture for basting. Skewer the chicken pieces with barbecue sticks, two pieces on each stick is preferable. Prepare the charcoal grill for grilling the chicken and grill them over hot charcoals turning on each side until every sides of the chicken is cooked. Wait for the skin to become reddish then baste it with the marinade on each sides. Do the basting of the marinade again if the chicken becomes dry until it is fully cooked. To see the rest of the recipe with the exact measurement of ingredients, continue reading. Soak the barbecue sticks in water for half an hour and set aside. Prepare the ingredients for the marinade. Mix together the vinegar, garlic, onion, chilies, salt, ketchup and pepper. Mix very well and marinade the chicken pieces for about 1 to 3 hours. Drain the chicken after marinating and set aside the marinade mixture for basting. Skewer the chicken pieces with barbecue sticks, two pieces on each stick is preferable. Prepare the charcoal grill for grilling the chicken and grill them over hot charcoals turning on each side until every sides of the chicken is cooked. Wait for the skin to become reddish then baste it with the marinade on each sides. Do the basting of the marinade again if the chicken becomes dry until it is fully cooked.